For over 35 years, Jacquard Products has been the leading manufacturer of artist materials for fabric. Family owned and operated, we are committed to offering top-quality materials at great value, all manufactured here in Northern California, to commercial studios, professional artists & craftspeople, home crafters, do-it-yourselfers, kids & hobbyists. Over 35 years ago, Rupert, Gibbon & Spider was incorporated by the Katz family as a distributor for Deka products and business was conducted out of the garage. The company transformed when President, Michael Katz, began manufacturing his own art supplies under the brand name “Jacquard Products” in the late 1980’s. Inspired by the silk-painting craze of the time (silk was hot in the ‘80’s! ), Katz introduced Red Label Silk Colors as Jacquard’s first product. To this day, they remain a staple of professional silk painters everywhere. This initial success invigorated Jacquard Products to produce more textile artist materials. New products have consistently been introduced every year, and now Jacquard offers over 20 product lines as well as a wide variety of kits, sets, class packs, chemicals and other art-related auxiliaries. Over the years, Jacquard has built a reputation for innovation and high-quality products. Michael Katz announced his retirement, in 2012, and his son Asher began running the company. Like his father, Asher is involved in every aspect of the business, from research and development to sales and marketing. Jacquard Products are sold in art and craft stores all over the world. Jacquard remains as committed as ever to meeting the needs of artists and crafters everywhere with excellence and value. In 1999, realizing a need for inkjet printing on fabric, Michael Katz developed a coating for fabrics and a paper backing allowing them to go through any printer – residential or commercial. After the success of that product, Katz created Jacquard Inkjet Fabric Systems. The company sells fabrics, inks, steamers and printers. It also custom-coats and paper-backs fabrics for use in wide format printers by other designers and artists. An online store for imported silks and other fabrics that are prepared for dyeing (silks and fabrics are sold by the yard and in a wide variety of scarves). 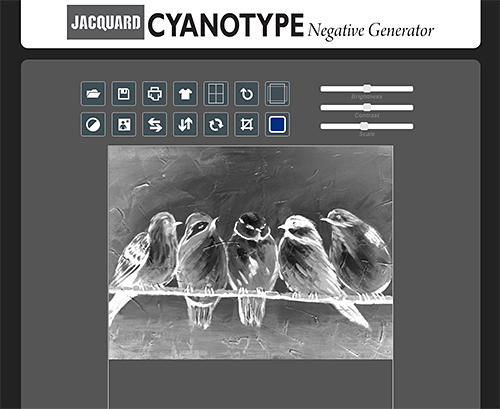 jacquardcyanotype.com – a website to turn photographs into film negatives for Cyanotype processing. jacquardsolarfast.com – a website to turn photographs into film negatives for SolarFast processing. The business name has an interesting story. People often call asking for Mr. Rupert, Ms. Gibbon or Mrs. Spider, but there is no one in the company by those names. Actually, pet primates and a grumpy neighbor inspired the title of the company. Through a series of quirky circumstances, Michael Katz’s father received Gibbon apes and a Spider monkey as gifts right around the time the business was forming. They were a constant, mischievous presence in the Katz household and throughout the surrounding neighborhood. A neighbor named Rupert caught the primates in his have-a-heart traps each time they escaped. So when the time came to fill out the incorporation paperwork, a brief discussion around the kitchen table lead to the new company name, chosen from the unique characters in their lives: Rupert, Gibbon & Spider. It may have been an impulsive decision, but it was set in stone when the incorporation papers were filed. But with a name like that, no wonder the company was mistaken for a lawyer’s firm so often. That is one reason the brand name Jacquard was born… which is another story entirely!